Precautions to keep in mind while washing the eyes. It is the eyes which help us to feel the beauty of the world. Due to pollution all around, it is essential that we take extra care of our eyes. First step in taking care of eyes is CLEANING EYES PROPERLY. To keep our eyes fresh, we should clean our eyes every three to four hours. It is very important for our eyes to remain clean and dirt free during all the times. This also helps to keep the harmful bacteria away thereby keeping it healthy. 1) Wash your hands properly: Before every touch to eyes you should clean your hands thoroughly. Cleaning the hands just does not mean rinsing. You should make sure you clean it with mild soap before splashing the water into eyes. 2) Temperature of Water: Be careful that the temperature of water is neither very cold nor very hot. It is advisable to use the room temperature water to clean your eyes. 3) Towel: Keep the cleaned and soft towel handy to wipe your face after the wash.
1) Tilt your face into the basin and look downwards. Use your palm to fill the water and splash it into your eyes. 2) Make sure your eyes are opened at all the times. There is no use if water does not enter into your eyes. This is the reason that water you use should be comfortable enough for your eyes. 3) Splash the water for almost couple of minutes. This will help to remove all the dirt from your eyes and make your eyes fresh. 4) Do splash water in both the eyes. 5) Use soft towel or cloth to dry your face after the wash. Pat dry (Move your towel on your closed eyes slowly). Do not rub harshly your face with towel at any time. 1) It is important to splash your eyes with water after getting up in the morning and before going to sleep. 2) Washing eyes every time after coming from outside is also important to keep it dirt free. 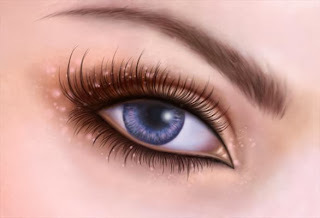 3) We should wash our eyes after exercise or after cooking or after the periods we have sweat a lot. 4) Whenever you feel the itching or any dirt particle entered into your eyes. During this period it is very important to clean it with cold water immediately until the dirt particle is removed. If that is not possible, hold some cloth near to your lips and blow out the air. Once the cloth is warm put that on the eyes. This will give you temporary relief. However, as soon as you come in contact with water, splash the water immediately on your eyes. Keep your eyes clean at all the times to see the beautiful world.